Outdoor Cannabis Cultivation Begins – But Is It Worth It? Tuesday Spotlight – Ontario-based Aleafia Health Inc. announced that it will be, according to them, the first licensed producer (LP) to take advantage of new federal laws allowing outdoor cannabis cultivation. It plans to expand its 7,000 square feet of growing area to 1.3 million square feet, mostly by taking advantage of outdoor cannabis growing. Aleafia said it is moving outdoors because costs are lower and yields are higher. “Conventional greenhouse cultivation is prone to significant crop loss,” the company states in a recent article (click on the link below for the advertorial). WeedMD, for one, has announced it will explore outdoor cultivation. However, CFO Keith Merker said he has concerns about security. LPs will still have to stick to strict security measures to prevent theft. Intrusion detection, physical barriers like walls or fences, and video surveillance would be required. There are other concerns. Some say that quality control would be an issue – it is easier to gain a higher potency from indoor operations. Cross-pollination of strains is another potential issue and many Canadian farmers already know. Not everyone agrees with these arguments. Ian Dawkins, president of the Cannabis Commerce Association of Canada, stated that the companies making these claims are essentially justifying the huge costs of their indoor bunker facilities. Outdoor facilities in Oregon, Washington, and Colorado in the US have shown that cannabis cultivation costs have come down, in some cases by more than two-thirds. “You’re going to see the market begin to realign itself into what we call a bipolar market,” he said. In this “race to the bottom”, one analyst said that it will simply be impossible for companies to remain indoor-only operations given the costs involved. 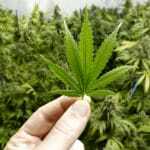 On the other hand, it may be one of the answers to the current cannabis shortages in Canada, which has had a huge impact on medical cannabis users. Aleafia on the Right Track with Outdoor Cannabis Cultivation? It appears that Aleafia may be on the right track with outdoor cultivation. Although the company doesn’t address quality issues in its advertorial below (except for stating that their new Niagara indoor facility produces the “best-quality medicinal cannabis”), it does state that it will reduce costs and increase yields, estimating its growing capacity will jump from 38,000 kg of cannabis to 98,000 kg. For larger LPs where cost is definitely a concern, a lower cost per kg of cannabis will mean a higher ROI. Outdoor cannabis cultivation then seems inevitable.